Designs by Lisa Somerville: Kitchen Sink Stamps - Howdy Y'all! Kitchen Sink Stamps - Howdy Y'all! Happy Kitchen Sink Stamps Monday! Can you believe it's November already, where has the year gone! With a new month, we have a new Challenge at Kitchen Sink Stamps, Julie is the hostess this month, and has issued the following challenge - Make a card or project with a monochromatic color scheme. Remember to be eligible for the prize drawing, your project MUST use Kitchen Sink Stamps - see details here. 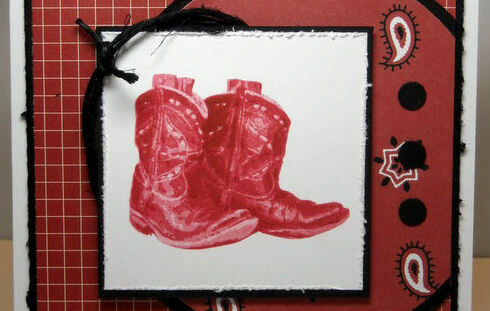 Very cute card, those boots are just the right color for me!!! Wish I had a pair living out here in the deserts of California! Great card! Adorable card. Love the circle. :) The boots look wonderful with the little twist of twine. That background paper is perfect with those boots! Love those red boots, so cute!! Have a great Monday! Everybody needs a pair of red cowboy boots!! At least here in Texas! These are sensational, Lisa! Fabulous papers and fun layout!! I can almost touch them, they look so real, beautiful card! Love your red boots! Awesome card and job with the challenge, Lisa! Searched high and low for some bandana paper ... threatened myself to make a stamp of it! LOL Love the black twine too! I so love these red boots, Lisa! So perfectly paired with the bandana paper too! Love the western feel to this! Just perfect! Super pretty monochromatic card Lisa!! I love the shade of red and the look of cowboy boots. Great DPs too!! What's not to love about red cowboy boots?? I love the DP and your lasso. A monochromatic beauty! Very cute card. Simple and sweet. Love the paisley print paper and the boots are fab. Thanks for sharing! Great card!! I love 'dem boots, and the way you wrapped a lasso around the corner of the panel! Such fun! !